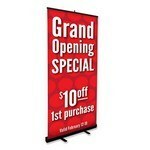 The 8 Foot Retractable Display Banner offers full color printing ability to insert your brand logo and message for Brand Recognition. Our Curved Fabric Stand Popup Stand - Double Sided features three sizes to choose from and allows inserting brand logo and message for Brand Recognition. 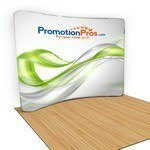 Our Curved Fabric Stand Popup Stand - Single Sided features three size options to choose from, Customizable with your brand logo. 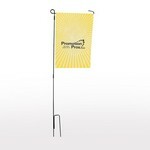 Our Garden Flag features full color custom printing to create exciting trade show displays with your brand details. 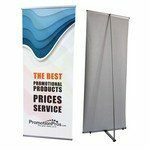 Our Double Sided Retractable Banner features easy to set up, lightweight and durable design and allows adding custom details to Promote your Brand. 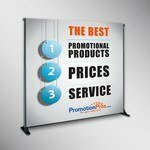 The L-Stand Banner B - Single Sided features full color printing capability and allows a full custom logo and message to create impressive Trade Show Display. 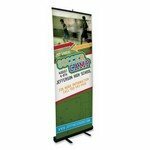 The Horizontal A-Frame Banner features spring stainless steel frame and allows adding brand logo to create personalized giveaways. 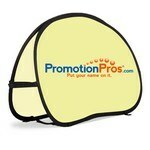 Our branded large retractable banner stand features a no curl banner with a protective laminate. 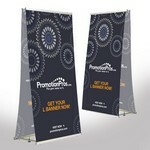 The L-Stand Banner A - Single Sided features full color single sided custom printing option for Corporate Swag. Our L-Stand Banner B - Two Sided features high quality soft polyester material and allows adding brand logo to create Corporate Giveaway. Our Pear Shaped A-Frame Banner features full color printing capability and allows adding custom details to make interesting Custom Logo Products. 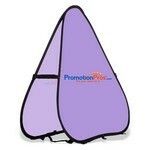 The promotional retractable banner stand features a no curl banner with a protective laminate.